My brother called me last night to ask why I hadn't blogged about Market yet. Others had. Others had even shared my news. But I was still lagging behind... apparently, I hadn't had anything else to do since getting home on Tuesday. So the next time you want me to blog, tell Mark. He'll be happy to call and pester me about it. This will make him happy too - this is Casey Jones, Mark's newly adopted rescue-stray. Casey is about three years old and a Border Collie mix. He's a sweetheart and yes, dog-napping has been considered. Except that Casey would be heartbroken, he's pretty much Velcro'd himself to Mark. Yes, they do things much bigger there. This is Ladies on the Lake by Lisa Bongean - Primitive Gatherings. It's so much better in person. The yellow is gorgeous and it sets off the blues and grays perfectly... and there's all this gloriously wonderful quilting by Linda Hrcka of The Quilted Pineapple. The fabrics are a mix of prints and woven plaids, all part of Lisa's upcoming Lakeside Gatherings, it's going to ship in December. Or January. Soon. I don't know if this quilt has an official name to it other than "that awesome Gardenvale quilt that we all want a kit for". It was made by ModaLissa using the new Jen Kingwell collection, Gardenvale. But this is what makes Lissa such a genius - the background fabrics are the woven plaids from Lakeside Gatherings! And the Dresden plate wedges aren't pieced - it's the result of fussy-cutting a couple of the fabrics in the collection. Now you want a kit too, don't you? That's me - on Friday after I'd finished setting up. The main carpet in the aisles hadn't been laid yet so that's why you can see my booth number in chalk on the floor. While I moved a few things around, my booth was very much like it was in Pittsburgh. I was in the back there too. I took this picture, rolled this out the back of the convention center and that was it for Fall Quilt Market. Except that my moving adventures are just beginning. Yes, I'm moving and yes, I'm moving to Texas. But being closer to my brother is the bonus, not the reason. If I was moving to be closer to him, I'd probably move to Houston instead of almost 4 hours north on I-75. I'm moving to Dallas. It's like this... I got a job - a "traditional" one. Instead of getting to work in my pajamas or stretchy-sewing-pants - seriously, how many of us actually do yoga in our "yoga pants"? - I'm going to have to take a shower, get dressed in real clothes, put on make-up, fill my travel cup with coffee and drive to work. And I'm actually going to have to talk to other people when I get there! What this all means is that you're not getting rid of me. Both can probably be counted on to make sure I blog a bit more frequently. I'll tell you how it all came about soon - for now, let it suffice to say it started with an e-mail "applying for a job that didn't exist." It's Thursday and that means how many more days until Market? No! Really! Please don't tell me... it's like those "Countdown to Christmas" clocks. I know it's coming and I know about when so I don't need the specifics. That only makes my head hurt. In the meantime... working on book quilts? Check. Working on the book manuscript? Check. Packing for Quilt Market? Uh... yeah. I'll get on that right away. I fixed it but Diane said I missed one... oh well. It's not the first time and alas, I expect it won't be the last. I think I got the backing right though - isn't it cool? American Jane - Potluck. With my leftover nine-patches down the center so that the backing would be just a teeny bit bigger. So Quilt Market is next week and I'm looking forward to it. It's going to be busy and hectic, but that's usually the best part about it. Someone asked me the other day if I was really okay, that I wasn't still a little tired from all the ups-and-downs of the past few years. While I think of and miss Rosie and my parents every day, I really am good and I find myself feeling an amazing sense of well-being. I wish I could tell you that there's a specific reason for it but no matter what's going on in my life, it's just there. And at any given moment, something silly or small or sweet makes me feel it. Like this past week... I was driving down the highway on my way home from errands when two songs I really like came on the radio, back to back. Taylor Swift's "Shake it Up" and Maroon 5's "Maps". (I like the song but I decided not to include the video.) How could I not dance along? So there I am, driving down the highway on a beautiful, sunny day, singing and dancing with the radio blasting. For that moment, life was good and I was happy, and that made me laugh - that and the realization that I surely looked pretty ridiculous. I did notice - and pass - a gorgeous Audi A8 driven by a rather nice-looking man. I was still enjoying myself when I got off the highway. Audi-man got off at the same exit and pulled up next to me at the stoplight, and when I looked over to admire his car, I saw that he was smiling and laughing... at me. He gave me a "thumbs up" and waved as the light turned green. I still laugh when I think about it. Since laughing is always a good thing, I want to share one of my guilty pleasures with you - a daily habit. No, sadly, it doesn't involve chocolate, though I have ocassionally enjoyed them together. Do you like Jerry Seinfeld? Okay, silly question. I don't think I know anybody who doesn't love him - he's that funny. Did you know that he has a website where he shares three short video clips from his personal archives every day? If you're watching it today, I really loved "Humans Are Designed To Sit." But "Viagra Guy" and "Death Is Number Two" are hilarious. And if you have a little more time, I also love Comedians in Cars Getting Coffee. I'm off - I have a haircut today. Wish me luck... Cameron said something about a buzz-cut. Okay. I'm kidding. I just couldn't help myself... you'll forgive me, right? I was just planning to change my hair! I was born blonde... and I've been blonde a few times since then, perhaps even when I shouldn't have been. The definition of "honesty" - when I went to a nice salon about ten years ago to "change my look", the stylist looked at my hair and said "... you do know this color does absolutely nothing for you, right?" I got over it - and he was right. But just so you know, I have a hair appointment the day before I leave for Houston... so we'll see. Will she still be a reddish-head or won't she? Until then - Happy Thursday! Or Friday. I hope you'll forgive me, I didn't intend to be cryptic and really, I didn't think I had been. But things always "sound" differently in my head than they probably read. It's pretty simple - I can't really show any of the quilts I'm working on for the book and since I don't have anything new for Market, that cupboard is a little bare too. I've been packing a lot of patterns lately for orders - a good news / bad news kind of proposition - but that's b o r i n g. I really do appreciate that you worry but I promise, I'm good. Life is good. And I'm excited about the future. One of my favorite Non Sequitur cartoons by Wiley Miller. I hope you have an awesome, fabulous, molto fantastico weekend! I'll do my best to have one too. I wish I could tell you that the title had something to do with "Fall weather" in Phoenix but alas, that isn't the case. While it's gray, overcast and a bit rainy today, it isn't exactly "Fall-like"... that won't really happen until November. After Market. It's ironic that I think of my year that way, not as four seasons but as two. Spring Market and Fall Market, with intermittent holidays and respites in between. I don't know if that's an Arizona-thing or a business-thing, but some of that will be changing soon. My big Courthouse Steps came home and because it's as flat as a mogul skiing course, I washed it before binding it in the hopes it would help. It did... but not enough. It's going to make a lovely "snuggle quilt". Back to the "matter at hand... that's really the reason for the title, the reference to "To everything there is a season..." from Ecclesiastes. Don't fret, I'm not getting all Biblical on you, it's just a way of saying that of all the things I've learned in the past couple of years, the main thing is that there really is a "right time" for everything. And no, there's usually not anything I can do about it. Except act on something when you realize you've gotten to a place where you either have to "fish or cut bait". Market is two weeks away and I'll tell you all about it after, mostly because there really isn't much to tell right now other than I'll be making a rather large-ish change soon. No really. This is just a random puppy picture from DailyPuppy on Instagram. A vicarious thrill. In the meantime, I working on the quilts and manuscript for the book. I've been asked about the book and this is what I can tell you... It's been in the works for several years but I kept postponing it when "life" got in the way. But when the Exhibitor list for Spring Market was announced, I heard from the nice folks at Martingale... well, that afternoon. End result - I was back on the schedule. My manuscript is due the end of this year - they want November 1st, I want December 31st... I'm thinking we're meeting in the middle somewhere. The book will be published next Fall - in time for Fall Market 2015. It seems like a long time but really... think about it. Editing me. That's a lengthy, time-consuming, arduous process. It will take a Herculean effort to get it done by next Fall! What's in the book? Easy answer - quilts. Better answer - scrap quilts. All the quilts are new and they're all "bigger" quilts - one is even 90" x 90" - and they're all very scrappy. I am worried about one thing though... so far, most of the quilts have a lot of pieces. Really. A lot. Pretty? I found these pieces when I was cleaning out some stuff in my workroom. They were part of a kit... I might have to add to it so I can make something else with it. I will be at Fall Market in Houston with a booth. I'm sort of in the middle - at the very back of the convention center. Seriously! I think I'm the last booth in the aisle. I'd like to think it's because I'm special - I'm the "milk" - but I think it's because I mailed my contract the day it was due. Oops. But I like being in the back, it makes me feel at home. It also facilitates a quick escape on Monday afternoon. (Pretend I didn't write that, okay?) And okay, it also means I'm not far from the ladies room. That's always nice when you're there by yourself. I won't have any new patterns at Market this time but I really want to go, partly for business and mostly to see the friends and folks who weren't in Pittsburgh. So the booth will look mostly the same but I'll try to re-arrange things. And since a few quilts weren't entirely finished in Pittsburgh, it "technically" does mean that they're new, right? So that's all the news that's fit to print. Except this - have you seen these really cute Halloween candy tins? I'm not usually a "Hello Kitty" kind of girl but I became obsessed with these when a friend told me about them and I saw a picture. JoAnn's has "had" them but they're running out - I bought the last couple at my store. But World Market also has them - for $1.00 less! They're about 2 1/2" tall and a bit less than 2" wide. I don't really care about the candy - that's just a nice bonus - I just want the tin. For pins or someting like that. Okay... or just because they're really cute. Until later... let it suffice to say that life is good and getting better. Really. Do you like short weeks? The week after a three-day weekend always messes me up. I get the days wrong and I feel like I'm missing something - not an entirely unfamiliar feeling in my neighborhood. Life here is again adjusting to a different pace... it's mostly good, it's a little sad, it's definitely life. It goes without saying - thank you. Thank you. You're the best. I loved the stories and I appreciated the hugs and kind thoughts. Rosie would have been fifteen next week and while she was strong and healthy for almost all of those years, everything seemed to catch up with her the last month or so. I've been trying to get some sewing in but it seems like I've gotten to do everything but that of late. I fell a teeny bit behind getting patterns re-stocked so a couple of orders meant I spent too much time packing patterns. And then there are those mundane every-day things like laundry, groceries, bills, stuff... it begs the question - do I need a husband? Or a wife? I'd vote for "boy toy" but I think that would just keep me distracted and then I'll be even more behind with work and chores. But with Fall Market and a book deadline looming... these blocks have been put in a storage box until later... January? Mostly Lexington with plenty of "other" Minick & Simpson included - piled on. Scrappy. Of course. For the book. I've been cutting quilt kits and finishing a little pattern that will only be a PDF - Lucy. It's available here and here. Just in time for Fall. Lucy is 74" x 74" - and you won't believe how quickly it goes together. A friend described the quilting as "spooktacular". Diane Tricka - she's amazing, and so is her quilting! There are a limited number of kits - they're in the shop now - here - but they won't be available until Sunday, September 7th. Right there in the center of the picture, the little oval on what looks like a branch. It's a hummingbird. Today is the second day in a row I've seen him - her? - there. He stays a few minutes - maybe just long enough for me to see him and take a picture. A friend tells me it's a sign of good luck coming. I doubt it will involve a "boy toy" but one never knows. This is one of my favorite pictures of Rosie. It was after midnight and I was trying to finish that quilt top. She was waiting for me to finish "whatever" so we could play. Or go to bed. Or for me to give her a treat. Probably all three. I've always wondered what she was thinking when she'd look at me with such a serious, intent expression... "What on earth did you do to your hair today?" "Just because you have a voice, it doesn't mean you can sing..."
She loved water. She loved hoses. She loved playing with the water coming from the hose. The girl knew how to have fun. No. Really. It takes a whole village of quilty-houses to have something this cute. A Parade of Homes from Quiltmaker magazine. I think you know I love house blocks. Every kind of house block - I love them all. It's this issue..September/October 2014. No. 159. Lori Holt - Bee in My Bonnet - drew up the blueprint. It's terrific - and it's easier than it might appear. That's because Lori is a genius and the house is built with units you already know how to make. Those little peaks in the roof? Genius. And easier than you'd guess. The block finishes at 12". I'm not sure why this is showing so neon-bright but it shouldn't be that way. The fabrics are April Showers... not Acid Rain. Everybody did a little something to make their house unique - to give it "curb appeal". Helen, Lynette and Gail all did some gorgeous embroidery - amazing. Gudrun, Karla and Julie have cool windows. Lynette has a snowman in the front yard and a moon rising. I have curtains, a portal in the front window and a street number - vintage French laundry tape. Please make sure you check in with Quiltmaker's Quilty Pleasures for giveaways, quilting suggestions and other cool house-block-related ideas during August and September. And if you don't already have a copy of this issue, and the pattern for this wonderful block, you can find it here. There's lots of other neat stuff in there too. Did I mention that you could win one of the original blocks? You can. Details here. So thank you to Diane, Carolyn and all the nice folks at Quiltmaker, and to Lori for asking me to be part of the neighborhood. The next party is at my house - I'll bring the chips. I've always been struck by the number of astronauts who describe Earth as looking so small and fragile from space. I think it's perspective - that sense of space, the notion that we're all here on this one rock together, we're all connected. Whether we like it or not. The quilting community is like that - no matter how much fussing there is amongst us over who invented what, which came first, how "whatever" is defined, we are all still connected. We like fabric - okay, we love it. We drool over it, lust after it, obsess over it. We share a love of needles and pins, threads and really sharp cutting implements. Mostly, we like making stuff... all kinds of stuff, any kind of stuff. So no matter where we live or where we come from, what we do or how we got here, we share a connection that makes our little "global quilting village" seem a little smaller. Still. When Sherri - A Quilting Life - asked me to answer four questions... I panicked. I'm not that introspective. Really. But I really enjoyed reading what others have written - Jesse, Kim, Paula - because I am curious about how other people go about doing creative work. Quilts! That's the easy part. I'm working on quilts for new Fall Market patterns and for a book deadline the end of this year. I have a "working list" of projects for both and I'm alternating between Market and book quilts. That means that when I finish a Market quilt, the next one is a book quilt. I was making blocks for the Modern Building Blocks quilt but alas, I've had to put those aside until December. Why do I create what I do? I know... I'm taking these out of order but I decided to deal with them by degree of difficulty. (I took tests in school the same way - answer the easy questions first.) And I took out the "write" part because I'm not going to include actually writing the pattern as part of the "process." This whole thing started with quilts so why do I make stuff - quilts in particular? Because I like the satisfaction that comes from being able to look at something say "I made that". I once saw an interview with Martha Stewart where she was asked why she thought she had become such a phenomenon and her answer voiced the same idea. Taking even a few minutes to make a meal, plant flowers or put a postcard in a frame is a tangible thing that speaks to who we are as individuals. Because I like knowing that there is something I will always be working to be better at. Creative pursuits aren't mountains to climb or even a skill to master. I can always improve my skills and learn new ones but I'll never know everything there is to know about quilting - and I'll never make the perfect quilt. And because I like figuring out how to make something work - like Flying Geese from a Mini Charm pack. And because I like that the things I make can become a larger expression of who I am, and maybe even of who I want to be. I know that I'm not alone in having made a quilt especially for someone, or having spontaneously given one away for some reason. Good or bad, pretty or not, taking the time to make something for someone is as much a gift as the finished quilt. As much as I enjoy teasing my brother about how he bores his friends showing them the quilts I've made for him, I love that he has a house full of well-used quilts. The challenge of it all! That's another reason. I've always thought that a big part of creativity is "problem-solving". From deciding what to make, what fabric to use, how big to make it, it's all a process of how am I going to make something that looks the way I want it to? As crazy as it sounds, doing this uses every part of my brain. I have to use math - which I loathed in school but was really good at - and I have to use that acquired skill set. Then there is the personal aesthetic, some of which is learned and some of which just has to be part of my DNA. This wouldn't be nearly as much fun if I wasn't fully engaged in the "building" of it. And finally, I do this because I like the teaching side of it all. I don't mean the traveling and psuedo-celebrity-ness of it all, I mean the stuff that's in the pattern. I'm writing patterns and books with the hope that something in those instructions will teach another quilter what they want to learn or need to know to make the quilts that are living in their head. Can I get an Incomplete? I think most of us get our ideas from other people - other sources. Whether it is an antique quilt or a style by a well-known quilter, a color palette from a famous painting or the pattern on a tile floor, most of us start and learn by emulating the styles and "art" of others. Okay, so Mozart was probably an exception, he created beautiful music as a teenager without any outside influence from Instagram. (Jerk.) I know that I am a pastiche of ideas, images, influences and visions from other people, mediums and interests. The best quilters - and artists - take those ideas and turn them into something unique and different. Something memorable. Art. Is what I do art? I don't know. What I know for sure - borrowing from Oprah - is that when I see an antique quilt, block, setting or even a quilt pattern that interests me, my first thought is always "what can I do to make this different?" Different from what I've done before, different from what I've seen at Market, in books or elsewhere. How can I make this "mine"? Any kind of design needs to be personal to be successful. Successful or not, this little addition makes mine different. There is a terrific quote by T.S. Eliot that sums it up perfectly... "Immature poets imitate; mature poets steal; bad poets deface what they take, and good poets make it into something better, or at least something different. The good poet welds his theft into a whole of feeling which is unique, utterly different from that from which it was torn." Substitute "quilter" for "poet" and that about covers it. First, thank you for assuming that it does. I appreciate that. Second, no, I don't use a computer to "design" a quilt. Nor do I use graph paper to draw out blocks or layouts. That's just not how my brain works, maybe because that's not how I started. It pains me greatly to have to admit this publicly but... computers hadn't been invented when I started making quilts - by firelight. And drawing on the cave walls was really hard. I wish I could tell you that ideas come to me in a flash but that rarely happens, at least it doesn't happen to me. It's often feels more like Whack-a-Mole... you keep whacking away at it until you finally - hopefully - hit the silly thing. The simple unvarnished reality of it all is that it's work - at least it is for me. Actually, I think it's that way for most people who do creative work. Good work - of every kind - takes practice and practice takes time. You don't get it right the first time, and even on those occasions when you do get it right, it doesn't mean you get it right every time. So the work can be frustrating and rewarding, stressful and sometimes a bit tedious. It can be a challenge - the good kind and the bad kind... like when I'm trying to force something that just isn't working. But it's the process of that work that I love - solving the problem, trying to get it right, learning something when it misses the mark, and then starting over again. It's that whole "microcosm of life" thing. And can I just say that social media doesn't help - it makes it all harder! All of those images of quilts and blocks that can be so inspiring can also have a very negative effect - Is this idea mine or did I see it on Pinterest? Wait - why is my quilt design all over Pinterest with someone else's name on it? Is my work good enough compared to "???"? Does having a lot of followers on Facebook mean your work is good? If you have the most, are you the best? The whole world wants to make "x" but that doesn't interest me, I want to make "y"... do I need to change? Still... without social media, I wouldn't have run across this genius summation of the creative process - This is awesome. (I am awesome.) This is not working. This is crap. I am crap. This might work. OMG! This is awesome! So even on those rare occasions when my idea gels quickly, there is still always going to be a nuts-and-bolts aspect to it. With quilts and that whole "design" thing - yeah, yeah... I really do have a hard time with that word - it goes back to the starting point of solving a problem. I have this fabric, what do I want to make? I have a block I want to use, what fabric do I want to use for it? And how big is everything going to be? It doesn't matter which comes first - the fabric or the block - there is some work involved getting from that starting point to any kind of finished piece - even before I start cutting. Most quilts start and live in my head - mostly. (How frightening is that?) Once I've got an idea percolating, I will start thinking about sizes and calculating some options. Straight settings are easy - the symmetry of the design needs an odd number of blocks, the blocks are 8" finished so 9 blocks in a row makes the center of my quilt 72". Is it going to get a border? If so, how big? I will confess that I do most of that in my head. (It's not any kind of math whiz thing, it's practice, familiarity and repetition.) Diagonal quilts are a little bit trickier. Some of the numbers are even - a 3" block has a 4.25" diagonal measurement, a 6" block has an 8.5" diagonal measurement. But an 8" block has a diagonal measurement of 11.313708". I probably have as many mini calculators in drawers in my sewing room as rotary cutters. Yes, I do think about other quilts while I'm sewing. If I've started with the fabric, then I have to decide if the sizes will suit the fabric. If I've started with a block, then I need to start thinking about what fabrics will work. Again, sometimes it all comes together quickly at that point. Other times... not so much. I've had brilliant, genius, amazing quilt ideas... that I can't find the right fabric for. And I've found gorgeous, amazing, spectacular fabric that I absolutely love... that I just can't quite come up with the right idea for. It's a process - it's work. And like any work... it doesn't always "work". Another appropriate quote... from Samuel Beckett - Ever tried. Ever failed. No matter. Try Again. Fail again. Fail better. Do I get a lot of ideas for quilts? Yes. Do I make all of them? No. Some shouldn't get made - ever. Fact - I have a lot of bad ideas for quilts. I also have a lot of boring ideas for quilts. I don't publish every quilt I make - some just don't come out the way I thought they would. (And the less-kind among us are probably snarking that I have published some of those bad and/or boring ideas. Meow.) Some ideas seemed really original when I started but ended up looking just like another quilt I made... or worse, just like a quilt somebody else had already published. The funny thing with quilts is that what seems like an epic failure will usually wind up being somebody's favorite quilt. Beauty is in the eye of the beholder. Now here's where I'm going to get that Incomplete... I was supposed to "tag" a few people whose work I admire and enjoy but I kind of dropped that ball. I've got a couple of inquiries out... but well... Market is coming and I don't like annoying women with sharp cutting implements. So I am hoping that if you have a blog, you'll answer the same four questions and share something about yourself. And don't forget to tell me! If you don't have a blog, feel free to share your answers in a comment. Now I'm off to sew some half-triangle squares - Market is less than 10 weeks away. Nope. Not that kind of lab work... nothing medical, though this did involve needles. Sutures - stitching. And I'm sure some anxiety and pain was involved... though not on my end of things. I'm referring to the Scrap Lab projects for Quilts 'n More magazine. This one. This is the most recent issue - Fall 2014 - and yes... Used with permission from Quilts and More magazine. 2014 Meredith Corporation. All rights reserved. If you don't already know, the Scrap Lab projects started almost four years ago with Camille Roskelley of Thimbleblossoms and Joanna Figueroa of Fig Tree Quilts as the lab techs - the "designers in residence". They were at the helm for two years - eight issues - and I was invited to participate for what would be their last issue. I'm sure that's just a coincidence. After that issue, Jill Mead - the then-editor of Quilts 'n More - asked if I would like to be part of the new "design team" with the amazing Patty Young of ModKid Boutique. Heck, yeah! Sign me up! (I have a bad habit of jumping into things without realizing exactly what would be involved.) Not too long after our first couple of issues together, Jill moved to another desk at American Patchwork and Jody Sanders took over the helm at Quilts 'n More. I'm sure that timing is just a coincidence too. While we were originally asked to be the team for a year, Patty and I wound up doing seven issues. The task for each issue was the same - Patty and I, and a "guest designer" were sent a fabric "packet" and we had to use it for our projects. We couldn't add any fabric to it - except for a backing or lining that wouldn't show. We didn't have to use all of the fabric sent, but what we used had to be a "representative" of the packet. There were a few other "suggestions" - no zippers and any embellishments had to be easily obtained by anyone wanting to reproduce what we'd made. Oh, and you had to make something different from what the other two were making, and from what you'd made before. In case you're thinking this sounds a lot like "work", you'd be wrong. It was one of the most enjoyable things I've done. If there is one thing I could change about it, it would be that we didn't get to go to the Quilts 'n More offices at Meredith Corp in Des Moines for a day to hang out and sew. Jill and Jody are smart, funny, amazing women, and seriously awesome quilters. Patty? Genius - The "guest designers" over the seven issues were Shea Henderson of Empty Bobbin Studio, Valori Wells, Monique Dillard of Open Gate Quilts, Lori Holt of Bee in My Bonnet, Allison Harris of Cluck Cluck Sew and I'm forgetting someone. (A pox on me for that oversight.) Wouldn't you love to sit and sew with these ladies? The thing about all this is... I really dropped the ball this last year and never shared what we'd been doing. When I was a teenager, I made lots of bags but somewhere along the line, I stopped making them - I blame Cole Haan and Coach. I love that out of the eight projects I made for Scrap Lab, two of them were bags. Shea made the cute quilt on the wall and Patty made that awesome backpack. Metro Ovals - we were sent seven fat quarters of the Metro Ovals and a 1/2 yard of Kona Cotton in Ash. This was with Valori Wells new fabric - we were sent a charm pack of the prints and a 1/2 yard of the background. The newest issue - shown above - had Patty, Monique and moi playing with batiks. We each received a Tonga Treat in Boysenberry - 20 strips measuring 6" x 44". I made all three of these framed pictures using about 1/4 of my strips and half-triangle squares of the same size. All three frames are standard size, easily found at any "big box" craft store, Target and Walmart, and frame shop like Aaron Bros.
Framing blocks and "quilt-y" things is one of my favorite things to do. And again - all pictures are "Used with permission from Quilts and More magazine. 2014 Meredith Corporation. All rights reserved." The last project will be in the Winter 2014 issue that comes out in November - I think. Patty, Allison and I were given a fat quarter bundle of Allison's beautiful new O Clementine fabric - coming out next month, September. And I made a quilt. Finally! It's pretty cute - it measures 64" x 64" and all you need is a FQ bundle... just saying... should you want to plan ahead. A little part of me is a bit sad that it's over as I really did enjoy every single challenge and project. There were times when I was absolutely 100% certain that I would never.ever.not-in-a-million-years.ever get an idea for what to make. And that was part of the fun of it all. I know! It sounds crazy... but I read once that having limits and restrictions force you to be the most creative - they push you further outside of your comfort zone because you have to find a way to make it work. So thank you to Jill and Jody for inviting me to play along. And I'm sorry that I was a little bit late sometimes. I'm back tomorrow with an "around the world" sort of thing. Did you ever see the movie "The Legend of Bagger Vance"? As movies go, it's probably never going to be regarded as highly as "Citizen Kane" but I've always liked it. The point of this is that there are a couple of times in the story where Rannulph says "it was a long time ago" and he's told "it was just a moment ago". So really... it's only been a few minutes since I was last here. Okay. It all sounded pretty good in my head. I know. I know. I didn't think I'd been quite so lax about checking in, and it wasn't like I hadn't thought about you. I'm just a twit and I'd think of you in the middle of the night - it's after 11 pm now - and then I wouldn't have any pictures I could think of. But when friends started asking me if I was ever going to blog again... and when friends were checking in via e-mail to make sure we were okay... here I am. Rosie is good. I'm good. Really. It's been hot - too hot. But I think that's mostly because we're both "getting up there in years" rather than anything dramatic happening with the mercury rising. Still, it's hot enough that we're both enjoying staying inside to sew. And I have been sewing. A lot. Shower Shuffle. Miss Cupcake and I made these quilts over the Christmas holiday last year using Camille-Thimbleblossom's video 25 Half-Square Triangle Blocks and her April Showers fabrics. Abby Latimer did the beautiful quilting, a design called Three Tours Wavy Stripe. And Cleone Levos quilted my Nested Churn Dash using a design called Modern Curves or Modern Eccentric. I just call it "that one I really love". Oh! The last time I was here, I said I'd check back in when my single block Nested Churn Dash was quilted... well, voila! "Organic" Straight Lines. My favorite kind - it's a polite way of saying "they're not even or straight, and no, I didn't intend them to be that way, thank you." I finally decided on bindings for both so they're also on the stack of "quilts to finish binding". As you can guess, sitting under a quilt isn't exactly the most appealing way to spend a summer evening in Arizona. But they'll get done. As for the sewing... some of it has been "just because I felt like making that". Purple Letter Day. (Red Letter Day pattern by that Thimblegirl.) I bought these Art Gallery Rock 'n Romance FQs a few years ago and I kept hanging on to them because I really liked the collection. They're not "me" in any way - they're purple. It isn't that I don't like purple, I just like it best in other people's quilts. Then it's perfect. But I really liked this fabric. And this quilt was perfect for it... I mean it still is, but it would have been more perfect but for a little "oops". I learned that I really shouldn't do my cutting late at night. You see, I had two stacks of FQs - one for the HTSs and one for the Nine-Patches and Rails. And I mixed them up and reversed my stacks. Oops. The funniest part is that even with the goof, I really love this quilt. Go figure! I promise a better picture - yeah, yeah, hope springs eternal - when it's been quilted. One last thing - I love this Red Letter Day pattern. I know I'm going to make it again. Soon. Maybe over the Christmas holiday. I finished my "Project 48" quilt - the one I was supposed to work on an hour a week until it was done. I didn't really keep to that schedule but who cares? It's done. It measures about 66" x 74" and I used a big stack of Daiwabo FEs I bought years ago. Because I wanted the fabrics to be the star of this show, I went with a simple-ish kind of design. 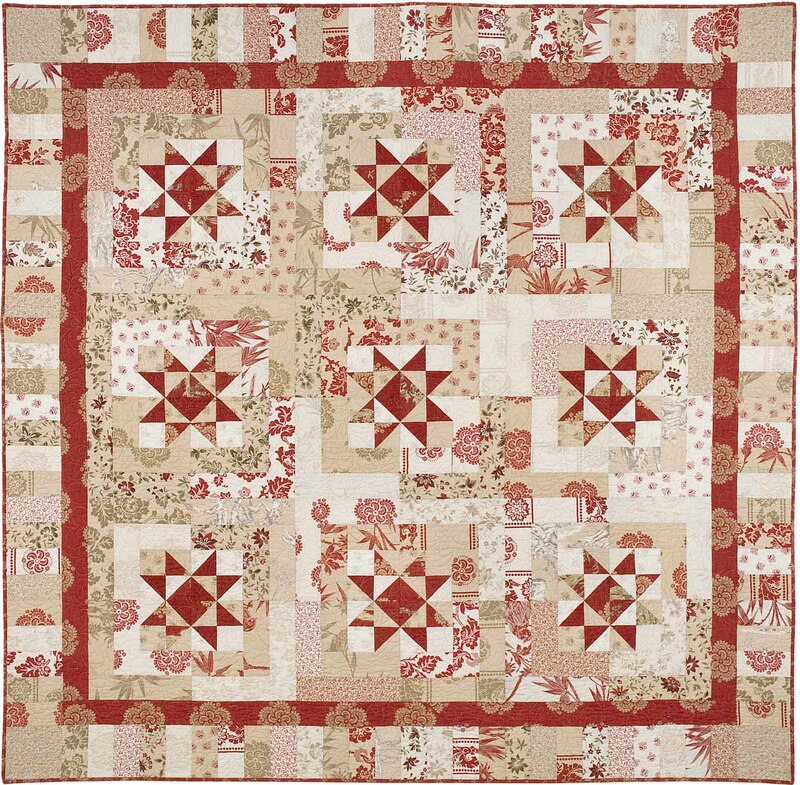 While I made my quilt all-scrappy and changed the size of the diamond, my inspiration was Zipper by Miss Thimble - again. How do you say Zipper in Japanese? I'm calling this quilt Ten Penny. This is as far as this project has gotten - but since I can't show you the quilt I made for my very last Quilts 'n More Scrap Lab project, these will have to do. And because I do have to occasionally do something that might possibly resemble "work"... I've been finishing patterns. The writing part. The big patterns are done. Seven Letters - Crop Circles - Freddy - Sugarboo. You can find them here. And the four new Schnibbles patterns are almost done... they should be ready next week. Zoom - Double Dutch - Harvey - Gertie. And they're all big - at least 68" x 68". So life is good. Life is busy. Life is life. I just wish it wasn't so hot... and no, cool weather is not just a moment away.